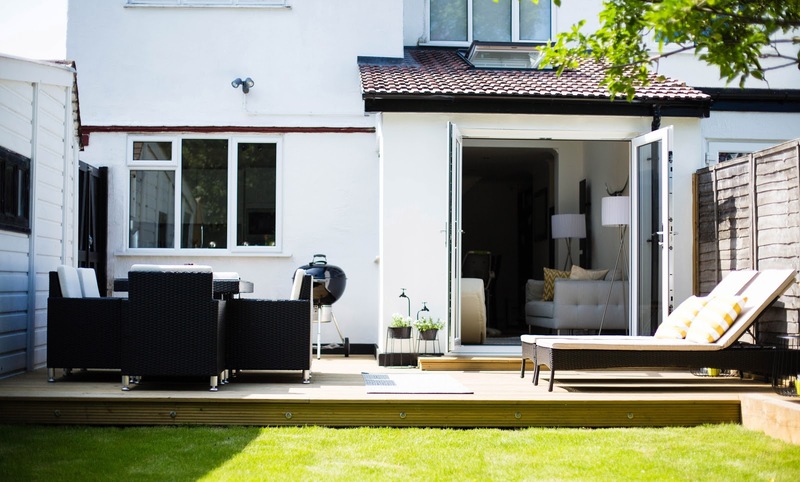 The new garden and decking have really transformed our outdoor living space and how we use it (see the before and after pictures here). We seem to spend a lot of time there; whether it's just hanging out or having a meal. It has become our second living room now and I've been trying to make it as cosy as possible in the last few weeks. I'm not finished decorating it yet but I feel like it's all coming together now. 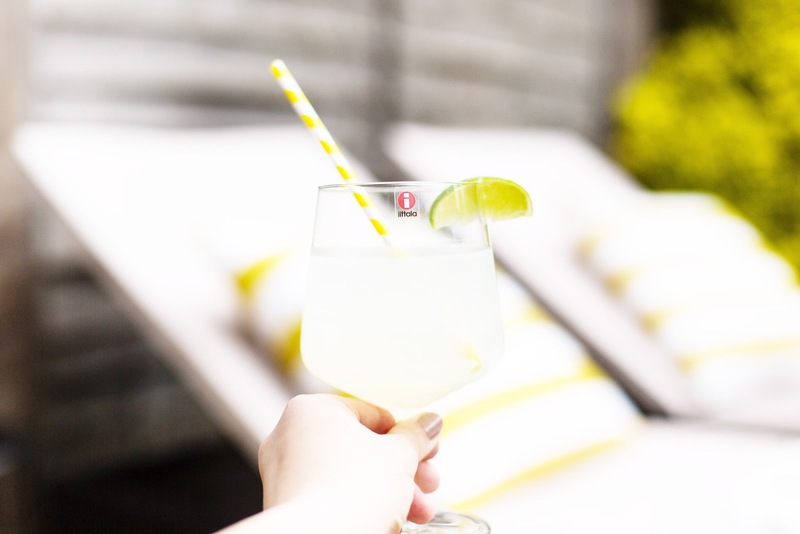 We can finally sit down and have a drink - and relax! It's nice to see that people are putting more effort into their outdoor living spaces these days. It's a clever way of adding some square footage to your home without breaking the bank. 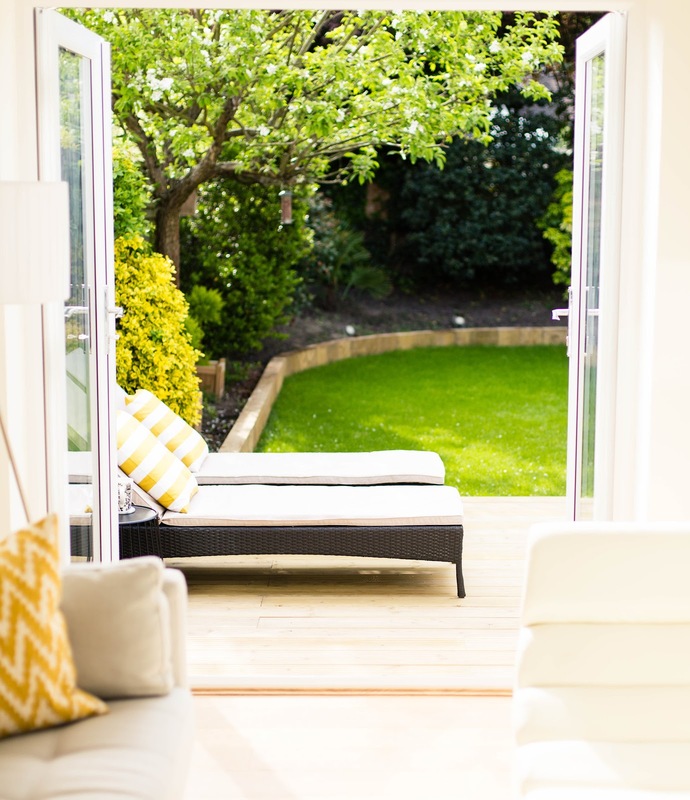 Patios and deckings are great for entertaining and can feel like another room in the house. 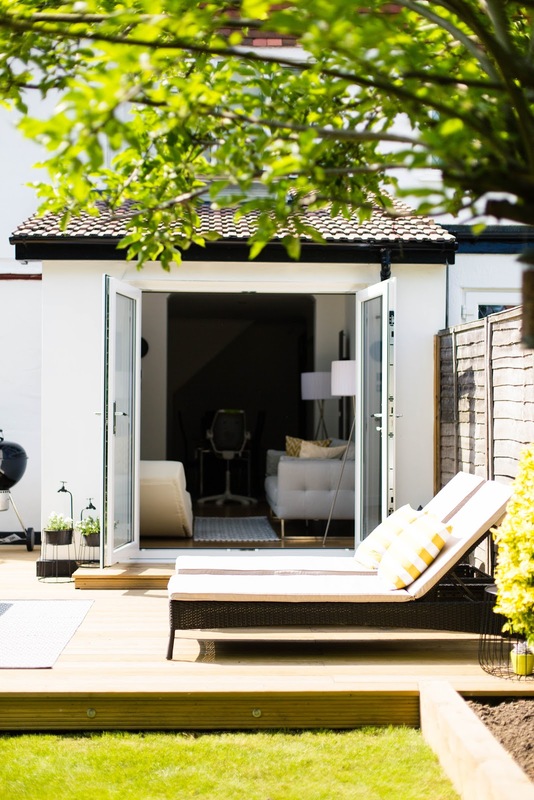 Of course that means that you shouldn't forget to accessorise and decorate your outdoor area; there's really no reason why it can't be as stylish and welcoming as the rest of the house. I like to use same accessories outside that I use indoors. Of course I need to bear in mind that some materials might be more delicate than others which is why it's good to test them first. 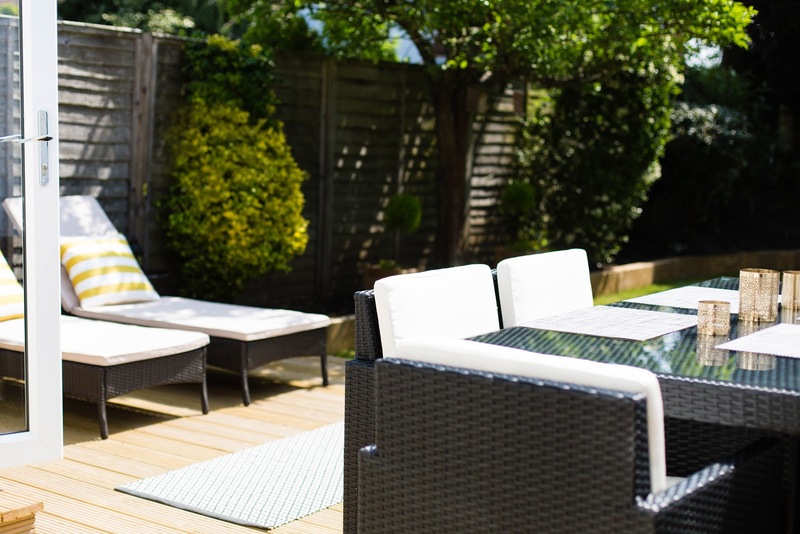 Before I started my garden furniture search, I decided a theme/style that I would go for. It makes the whole process easier in my opinion and it also means that the garden will flow well with the rest of the house. That's why it made sense to stick to a monochrome theme. 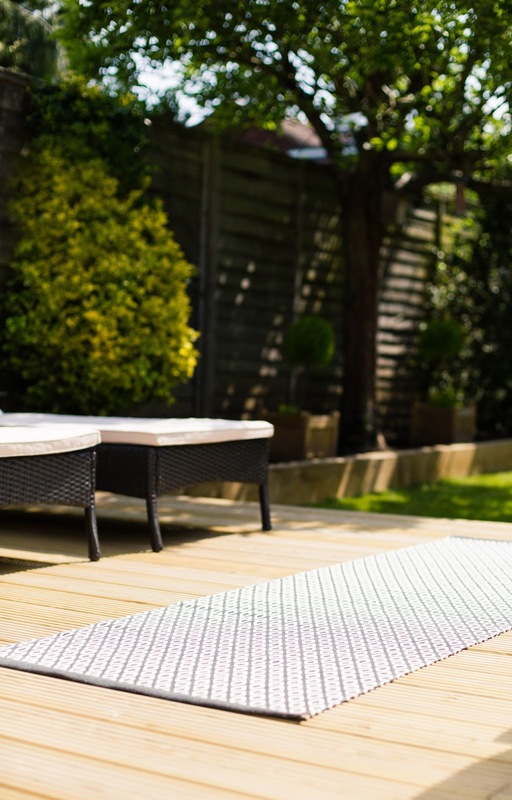 The light timber decking looks striking against black furniture in my opinion and gives the garden a bit of drama. I also happen to love Moroccan style furnishing at the moment and had a few favourite pieces that I wanted to incorporate in this dramatic look. 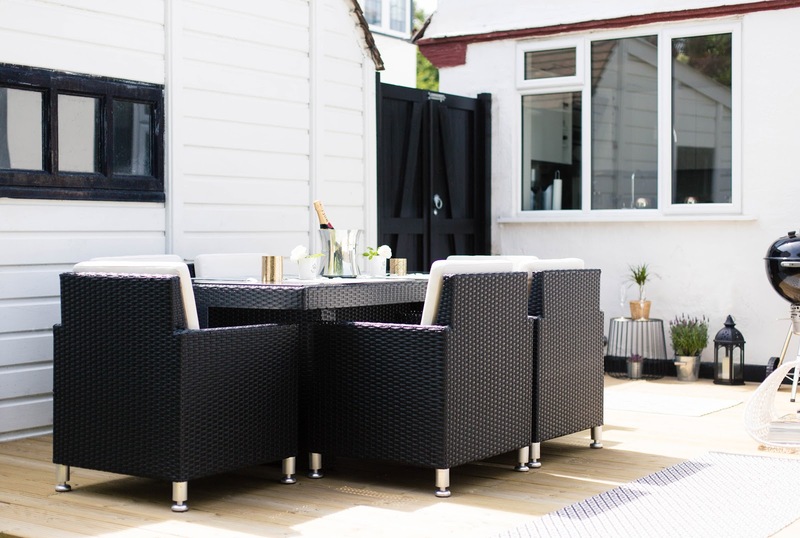 We decided to go for black rattan furniture to match our old sun loungers. It was quite nerve wrecking trying to find the perfect dining set to be honest. Most garden centres are stocking light grey and brown garden sets at the moment so it seems I'm going against the trend here. 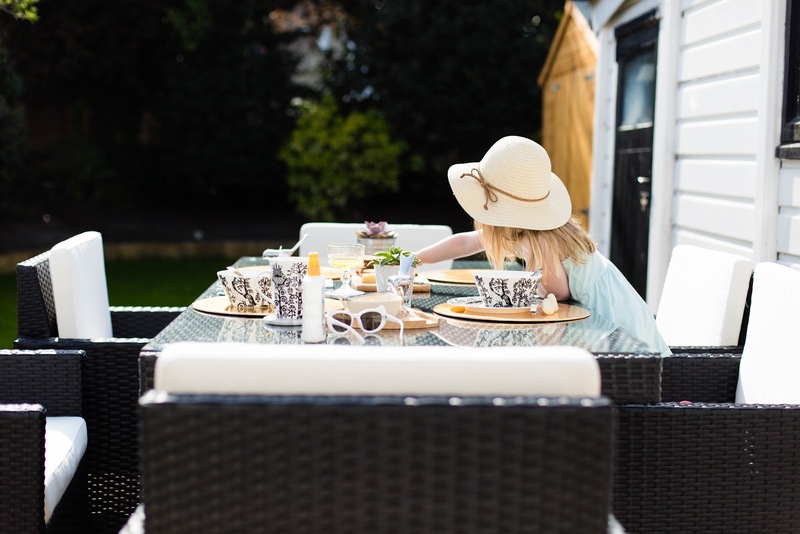 I finally found our Sicilia black rattan dining set from Alexander Francis, and although I was worried about ordering it online, it is the best quality rattan I have seen so far. The size is perfect and it fits 6 people (more if you add extra chairs). The cushions are white (luckily the covers are removable) and it is the most comfortable garden dining set I have ever used. Seriously. I think everyone is so in love with it that we have been having breakfast, lunch, dinner outside if the weather has been good. Our old dining room table certainly doesn't provide the same views to the garden. Even though I love decorating with black and white, I felt the space needed a bit of colour. I decided to brighten it up with yellow striped cushions from H&M. Lime and yellow are really the only splash of colour you will see in our little monochrome sanctuary. They just seem to go so well with the rest of the garden and bring a bit of colour to our the monochrome theme. I also made sure that our extension décor complemented our garden style. I wanted to create an illusion that they are almost the same open space/room and colour matching is a great way to achieve that. Our black metal wire side tables are from La Redoute but I should mention that they are not specifically designed for outdoor use. They are metal so I figured they would probably survive the wet, and hopefully sunny, English weather. It's looking pretty good so far although metal tends to scratch quite easily so I use coasters with them. I would consider spray painting them in case they fade or get some nasty water marks. Obviously I wouldn't leave them out for the colder months and I'm hoping to use them indoors during winter. 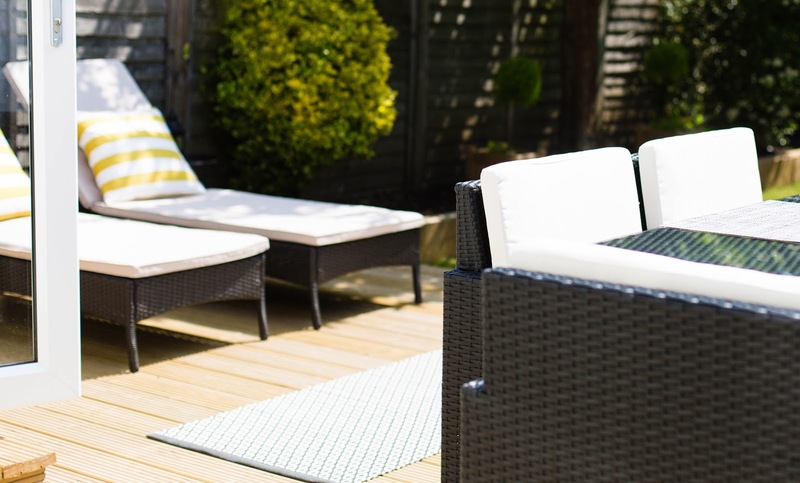 By the way, some indoor furniture can be used outdoors but you may need to treat them first, especially wood. 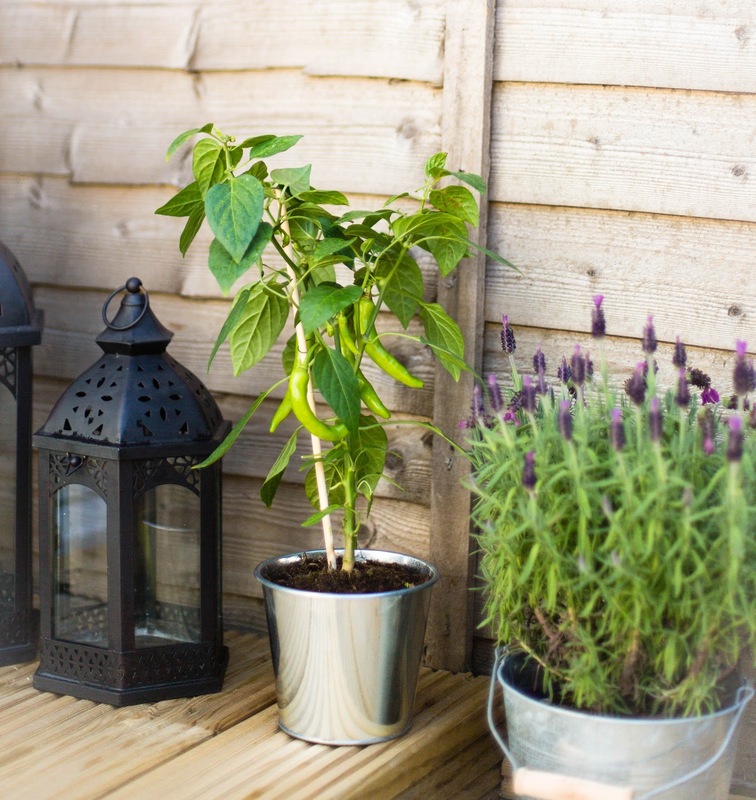 Outdoor living space wouldn't be complete without some pretty flowers and plants, right? I like to stick to easy maintenance plants if I can. I love structural plants and succulents. Succulents are so easy to care for and look pretty all the time. I couldn't resist planting some chili pepper though (I love spicy food) and of course I had to have some white flowers on display as well. I can't seem to get enough of patterned rugs at the moment (you can read about my new Moroccan rug here). 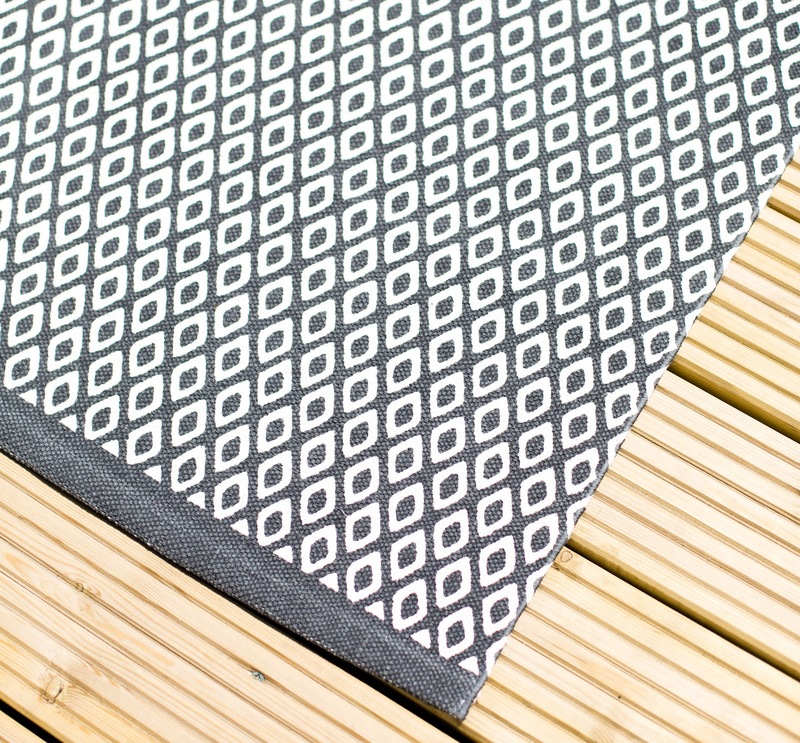 I find that rugs bring texture and softness to any living space and felt our decking was lacking that a little bit. I love the softness when I walk on it barefoot and our children can sit and play on the rug as well (timber can be a bit hard). The black and white patterned cotton rug goes well with black furniture and because it's dark I'm not too worried about it gathering dirt. H&M rugs are also machine washable which is handy. There are still few things I'd like to get for our outdoor living area. I'd love to add some wall art or ornaments to our décor. 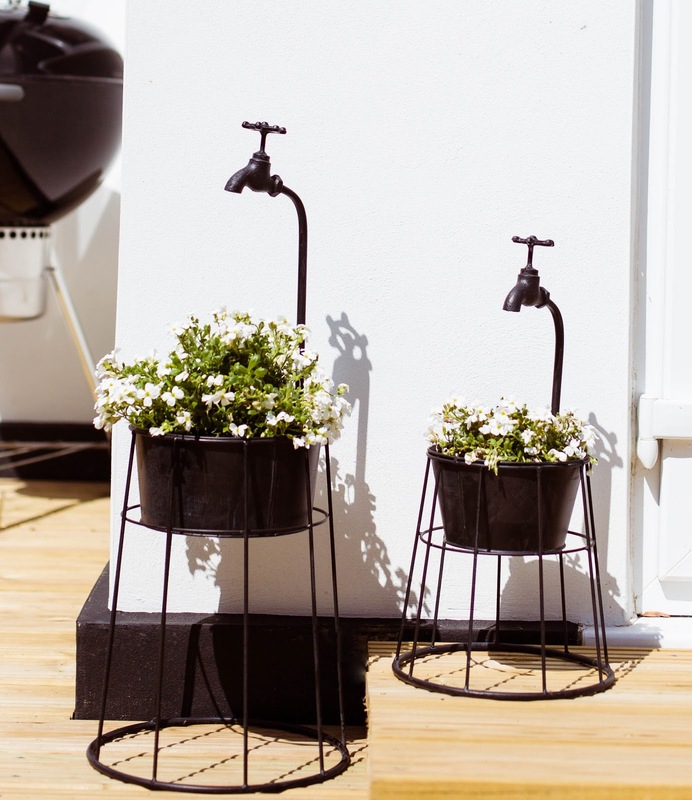 Exterior walls and fences can be great for decorative objects and Wayfair have a pretty good selection of garden accessories at the moment. Also, I wouldn't mind a hanging up some fairy lights to our wood fence. Fairy lights are great for parties and you can bring them indoors if you fancy a change! When you are decorating a room/space take as many pictures as possible; before, during and after. I often look at my photos and realise that something is missing. It can be difficult to envision a room that is not complete yet and pictures always help me to look at the space from a different angle. Oh wow. This is so beautiful. We're just starting to think about our outside space (although saving up to make it a reality might take a while yet! Damn money not growing on trees.....) and this has given me so many ideas. I love the tap planters too. They are so cool! 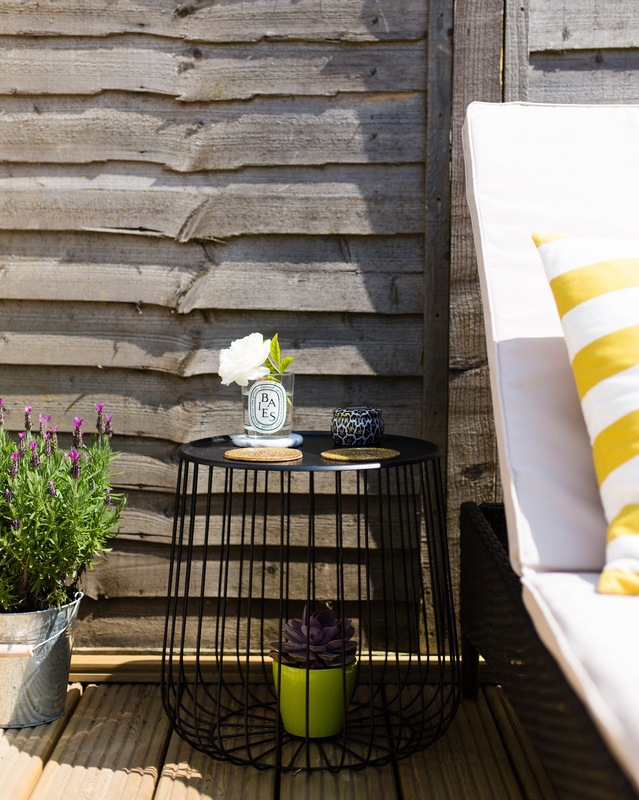 Decorate your garden with personal and everyday items and create a sort of a 'junk garden" which allows for creativity and style on a very limited budget. 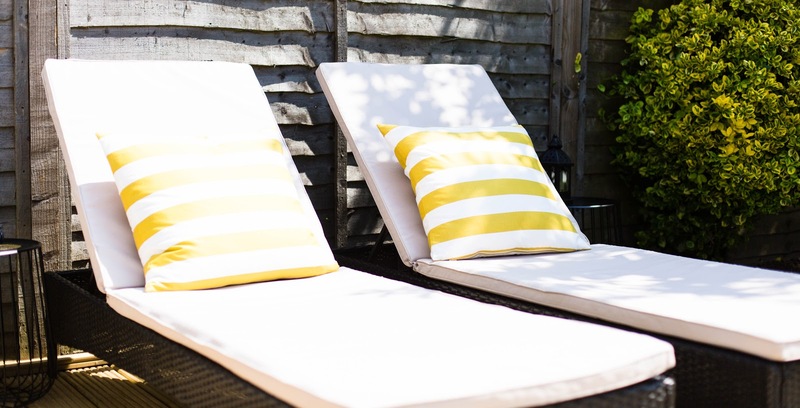 Today backyard family get togethers and parties have multitudes of choices for not only things to do, but also ways to get the fun times done. One of the things that families can do together is to build a fire and sit around playing music or chatting and even have grandpa tell a scary story or two for the kids around the fire More hints. I needed a new set of living room furniture since my dog destroyed all the sofa's cover and they can not be changed which is really costly. So I am looking for furniture in reasonable price. 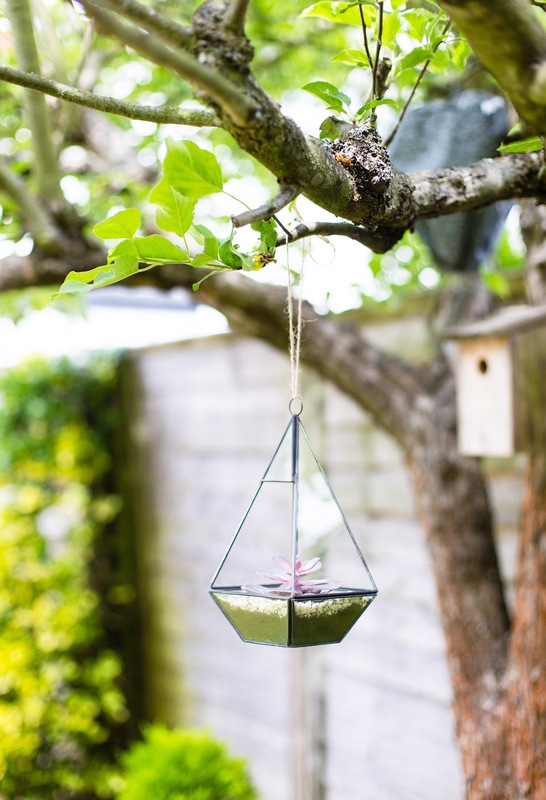 It's wonderful guides for garden decoration.You know, when you buy or sell house, garden is one of impressive place you must take a look. Thanks for helpful share! Thanks. Just continue composing this kind of post!